When we first got the forum software and were trying to figure out how we wanted this place to look, Kratos mentioned to me that it would be helpful to have a place for heat treating recipes. He said something to the effect of, "We need a place for HT recipes". Now I thought he mean "hometown recipes" and I told him we were a bit small to have hometown forums just yet. Suffice it to say we got a good laugh out if it! Anyhow, we do need a place where we can easily find and refer to heat treat recipes. So this thread is it. I'll start by listing a couple of formulas I've developed by trial and error. So first off, I use O1 almost exclusively because it's been easy to work with and it's slightly more corrosion resistant than the simpler 10XX series carbon steels due to a higher chromium content. I use a 27" deep Evenheat knife kiln with their rampmaster controller. I quench in mineral oil (horse laxative). So for a typical 3/16" thick blade, I put the blade in the kiln at room temperature. I have the kiln set to ramp up the heat as fast as possible until it reaches 1225*F and hold there for 15 minutes for stress relief. Then it continues to ramp up to 1500*F and soak for 15 minutes for 3/16" steel, and about 7 to 10 minutes for 1/8" and 5/32" thick steel. I have my quench tank right in front of the kiln and I try to get the blade into the oil as fast as possible. I have learned to agitate the blade either up and down or front to back, but never side to side, as this helps prevent warping. I heat the oil on top of a small electric tabletop range to 135*F before quenching. This is a slower oil that is not suitable for 1095 which requires a faster quench since it must cool to below 400*F in about 4 seconds or so for full hardness. This gets the steel hard enough for an RC60 file to skate off of it. After quenching I clean the oil off in hot soapy water and immediately move the blade to a 385*F oven for 2 hours, then take out the knife and let it cool in air. This gives me a hardness between RC55 and RC60, tending toward the softer side, as verified with my hardness testing files. Another formula I use for making flint strikers out of 1095 is to heat as for O1, then quench in hot water. This gets the steel cool fast enough to get very hard. It can then be tempered relatively cool at about 325* for an hour or so just to relieve stress from the quench. Here is a helpful link to Evenheat's heat treating information page. Lots of good info there for folks using electric heat treating kilns and ovens. Hope you find this helpful. Please share any of your heat treating recipes here in this thread. Remember to tell us what equipment you're using, times and temperatures (or color temperature) and quenchant type and temperature. And of course, we need to know what type of steel is being treated. The stuff I've learned on this forum in just the past few days.....INCREDIBLE!!! Good Stuff! Man, I'm feeding on this like a Hungry guppy!!! Hmm... seems way more complicated than my recipe: heating it up red hot until it is non-magnetic, dunking it in a coffee can motor oil, then throwing it in the kitchen oven at 375 for a couple of hours. Of course your results are likely better than mine LOL! Nothing wrong with that method if it makes a good knife. Thanks for posting your recipe! Yep, depending on the size. Mine was a bit more because I chose a 27" deep model. But this will allow me to make machetes and short swords if I ever get the inclination. Have you seen either of these or know anything about them? There is a controller option that looked reasonable too, but I can't remember where I read about it. I looked at those when I was choosing a kiln. I can't remember what pushed me in the Even Heat direction. But I've heard of people that use them over on other knife forums with good results. Maybe it was the maximum available size or something. I'll look for the programmable controller conversion. As I remember it can be done anytime with nothing to change, or maybe there was a mounting plate too, but either way it was reasonably priced in comparison. Having to start off cheap, I thought it was looking pretty good. I'm like to become a hobbyist knife maker, and this post helped dumb down the heat treating process for me. I'm still scratching my head with it all, but hey gotta start somewhere. Any chance for some pics on about what color the steel should be for the quench? I'm not a forging guy, but if I was going to use a forge to heat treat I'd use a magnet at first to let me know when the steel is ready to quench. Since hot steel will look different in different ambient lighting conditions, using the magnet will give you a better idea. In regard to Strikers, it wa my understanding that they shouldn't be tempered, just heated treated to be brittle in order to throw more sparks. Obviously, have some contradictory info in my hands. HELP! I don't need a bigger knife, I need smaller wood! I heard that as well. Many strikers will work fine without being tempered, no problem. But after experimenting with tempering them at around 300 degrees, I find that they still throw good sparks, but the (slight) chance of breakage is reduced. Tempering helps to relieve some internal stresses from the quench. But such a low tempering temperature might not do too much for some steels. I guess the way I look at it is that if it doesn't hurt and it might help, why not do it? Agreed, the multi tool that I got from you throws sparks like a ferro rod! I don't have a kiln or anyway to measure the steel temp. 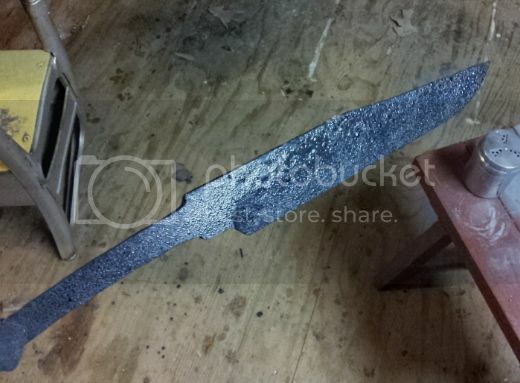 I use 1084 steel since it is the most forgiving and heat it in my free standing fireplace until it is non magnetic (test with an actual magnet) then quench in canola oil, blade down first for about 30 seconds then dunk the rest. I then immediatly take it to the preheated oven and let it sit at 400 for 1 hour, take it out and let it cool to room temp then heat it again for another hour. I'll add my .002 on the heat treating. My kiln is an ancient jeweler's burnout oven I bought years ago when new. I have run through a lot of controls, but have now settled on just a pyrometer that serves me very well, because of the way I use it. After forging, I do a forge aneal, cooling either in the forge if it's a single or in kitty litter if I have several blades to do. My steel is always 1095. I actually preheat the oven to 1450, because I have found that the longer the blade stays in there hot, the worse the decarb on the outer layer of steel is. I also depart from the accepted method by leaving the cutting edge so thin that it is barely visible before heat treating. Any thinner than that and the edge may buckle when quenched. I usually hold the temp once it gets to 1450 again, after placing the knife in the kiln for about 5 minutes, via the on-off switch. I then quench in soy bean oil by thrusing it straight into the oil like a sword thrust and then up and down. When I remove it, I wipe it down and confirm hardness with a file. When I used to heat the knives all the way from cold to hot in the kiln, there would be a layer of soft that filed from the cutting edge before hitting the hard stuff. No more... 5 minutes in a kiln going from 1400 to 1450 doesn't decarb enough to let the file take anything off the edge. Hello everyone. I am not sure if this is still wanted or not but I have a different approch that may help some here. I use a scientific approch to heat treating as well as industrial quenchants. Please don't think I look down on veggie oils or primitive setups as that is far from the case as I cut my teeth on those very same tools. I am not an expert either but do study and follow sound metallurgical methods to get the desired traits from the steel of choice. If its wanted I can explain the 3 types of steel and what that means to us to get a better heat treat. I work with aldos 1084v 1095 O1 and cpm 3v with 1084 and O1 being the bulk and 3v third. All are carbon steels and what follows are general processes when I heat treat. Normalize before grinding- this resets the crystalline structure of the steel and better distributes the carbide equally through out the blade. Thermal cycle the blade. This refines the grains and relieves any stress induced by the grinding process. Doing all the above will also reduce warping during quench. Heat the quench oil to 120-130* I use Parks 50 for o1- this make the quenchent cool the blade quicker below the pealite nose. Quench for 7 seconds in Parks 50 then allow to cool to room temp. After the 7 seconds in the quench the blade should be approximately 400* when I hand it to cool. I'm not familiar with pbc, is that a like a refractory clay or something? I assume it's a coating to exclude oxygen like a foil wrap. Where can you get it? PW Tracy at USAknifemaker has it. It comes in two types but Tracy only sells the regular which is rated to 1600* once you are ready to heat treat in a controlled oven, not a forge, heat the blade up for a minute at 650-700, pull the blade out and sprinkle the PBC on the bothside of the blade, spine and tang. I use a shaker cup to sprinkle it out at a controlled rate and I place some foil below the blade to catch the PBc that does not coat the blade. I do all this while holding the tang with the tongs. You can pour the PBC that is on the foil back in the shaker. A pound will last a long long time. I will finish the blades to 220-320 grit around .015 -.020 at the edge. treat with PBC and after heat quenching the blade will still be just like it as before it was treated. PBC is water soluble and any that is left on the blade after the quench will quickly come off in hot water. I will still take the edge to .007-.010 after heat treat but I never hafta contend with hardened scale that naturally forms without the coating. You dont want to use it in the forge because you cant see the color of the steel if judging by eye. I have a thermocouple in my forge to tell me the temp but I I always heat treat in the digital PID controlled oven where I know the exact temp. That is till I finish my salt pots later this year then its all rock and roll! Here is a bowie I forged from 1095 with the PBC sprinkled on it. remeber you must preheat the blade around 600-700 degrees so it will stick to the blade when sprinkled on. You can see the shaker can in the pic. Here it is after quenching and straightening just before temepering. See its still clean. Nice! I will have to order some of that. I have been using an Evenheat kiln with the rampmaster controller form the beginning, so controlled temps are no problem for me. I have wanted to experiment with 440C but need a way to keep the decarb away. This sounds like a much better solution than foil because I don't want to lose valuable seconds and miss the "nose" while I get the blade out of foil. I am also considering using a hot brine quench instead of oil for my next attempt at 1095. Decarb on the 440C is pretty brutal without a coating. It hasn't been a big problem for me with uncoated O1, however. I have been using the PBC special for over a year now and love it. The special which Tracy does not sale any longer is rated at 2100* however I decided to use it on my cpm 3v blades instead of foil just to see how well it worked. Well short story is I lost them so I still use foil , double wrapped , for heat treating 3v. no problem with the foild when using the quench plates and positive pressure. added note is once the salt posts are finished no foil or coatings will be needed for any of the steels as the salt forms a seal on the steel. Kevin Cashen told me he takes his blades to finished dimensions when using salt as there is zero issue decarb. when its dry i close up the shop so its fairly dark and heat slowly and evenly in the charcoal fire until just above critical and quench straight into very warm rain or snow water...if the steel doesn't crack from the stress, it has been born as a blade...tempering is either done on the coals (but this takes a real delicate touch and lots of patience) or in the oven for consistency in batches of 2 or more, and i often temper quite hard as the differential process goes a long way towards preventing brittleness. the metallurgy behind this is that the edge cools at a rate fast enough to freeze the carbon in place, creating a very hard type of steel crystal called martensite, while the body cools slower and forms a tough matrix of ferrite and pearlite...instead of compromising to find a midpoint between hard and tough, the steel properties are diversified to where they are needed most...so cool! just some of the insights i have gathered over the years, still lots for me to learn! some destructive testing on a clay-tempered blade (that turned out to be non-destructive), showing the dual characteristics of hard edge and tough body enabling a little blade to be hammered through a 3/8" steel rod without damage...don't do this at home! Cool post! Thanks for adding it. I use a 24 inch 220v 20A Paragon. For steels like CruForgeV, 115W8, 1084 and my 1084/15N20 damascus, I will austenize at 1500F and temper at 400 for most knives and 375 or so for kitchen knives. For W2, if I doing a hamon, I will run that down to as close to 1425 as I am comfortable with. I temper at anywhere from 375 to 425 depending on how the knife will be used. I use Parks 50 for most of the steels but I do have some 11-13 second oil for thin cross sections of the deeper hardening steels. I don't have to heat the #50 except when the ambient temperature drops below 70F. it has a lower operating range than the oner quenching oils and supposedly loses some of its cooling ability of you let it get hotter than 120F. the 11 -13 second oil, on the other hand, supposedly is fattest (11 second) at around 150F and hits the 13 second mark above(180) and below (125 or so) that sweet spot. I typically don't let any knife leave my shop any softer than 60Rc. One thing that I have discovered is that if I do a stress relief cycle for an hour at around 1200F or so and then let it cool before I harden, I pretty much eliminate any warping. I use the liquid anti-sale compound. A bit of warning for those using the pcb powder. If you get a lump of the stuff on the blade, it can cause pitting. it must be an even coat. That is why I went to the liquid. It may not leave quite as clean and shiny a finish, but no pits. I'll share with you what I do(the majority of the time). There are many ways to heat treat but it all revolves around the same unchanging metallurgical principles. Having a basic understanding of what is happening within the steel goes a long way. Carbon content and alloying can(and should) dictate the way you approach heat treating. In no way am I saying you can't harden a blade by getting it red hot and quenching... In its most basic form, that pretty much sums it up. You can derive simple heat treat regimes, using minimal equipment, if you understand what it is you need to accomplish. AND most of all.... you will be able to TROUBLESHOOT your process when things go wrong. Steel Phases - Austenite, Martensite, Pearlite(coarse and fine) are a good start. Also, Curie Point, Decalescence and Recalescence. Informational Aids - Carbon Equilibrium Chart**important**(Eutectoid, Hypereutectoid and Hypoeutectoid), TTT Charts(nose curves, Ms, Mf,), Young's Modulus. Electric Kilns - Beware the overshoot/spike caused by IR radiation! Allow your kiln to come up to temp and equalize before putting your blades in. (unless you program accordingly, with lower preheats and slow ramp speeds). Calibrate your kiln on a regular basis and buy a second(maybe third) pyrometer to keep things in check. Heat Treating in a Forge(particularily, gas forges) - Choke plates and Muffle Pipes are your friends. Warps - Three-point straightening jigs scare the poop outta me. Straighten during the temper cycles... look it up. Interrupted quenching works also. You can clamp your blades between plates directly after the quench, too. ... There is more. Like I said, you can make knives without all this... but it sure helps. This sets up the steel for success in the final quench. It is important to cycle with descending heats for even grain refinement. You don't want to erase what you've done in the previous cycles. The quench on the final 1475F heat locks in the grain size and carbide distribution. The three sub-critical heats at the end completely tempers out the martensite you just formed, making the steel easy to drill, grind, etc... It is basically a "redneck spheroidizing" treatment. - Heat to 1475F-1525F(depending on your steel), soak if necessary and quench in oil. I rarely use water anymore but some do with good results. - Temper soon after the steel drops below 130F. At least (2) 1 hour cycles 400F - 450F, depending on steel and intended use. There are solid reasons why I do what I do... but it isn't the only way(Do you think I said that enough?... lol). Don't worry bout nuthin... cause nuthins gonna be okay. What are "rood results" ? That's obviously "good results" said in a Scooby-Doo voice! Thanks for posting this, Rick! Yeah, that was a very informative post......keep it up! Thanks, Rick. Great post, even if most of it is over my head/beyond my skills/needs. I remember a long time ago a tip you gave me was breaking up my charcoal into popcorn sized bits. I'm wondering do you still recommend this? Just curious if like your heat treat, have other of your processes changed?